Our preferred mapping method is to use aerial photography augmented with plotted GPS data where necessary. This is most cost-effective, being efficient in time without losing accuracy. When asked to map a farm, Farm Mapping Services searches the providers for the most suitable up-to-date photograph(s) that includes the property. If need be, we can arrange for a new photo to be flown. If the property is large, several high-resolution aerial photos can be joined (Mosaiced) with a high level of accuracy. With the advent of advanced computer software, GPS systems and improved databases, farm maps can be made for any farm anywhere. 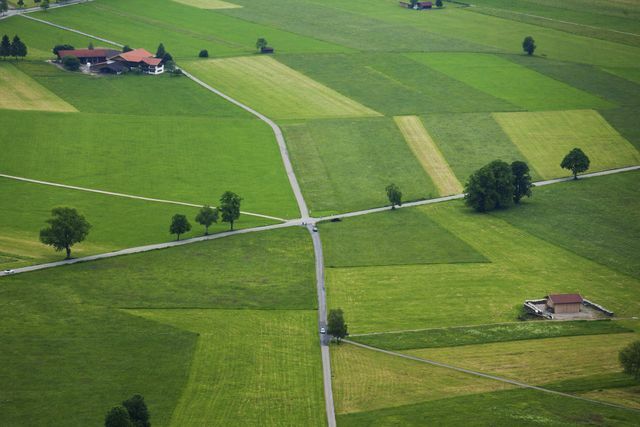 Using an aerial photo as the starting point, a combination of digital map data and augmentation with plotted GPS data where necessary and farmer knowledge, a farm can be mapped cost-effectively to a high degree of accuracy. We visit you to complete your map, sitting at your table with someone who knows the property well enough to add all the features you need. Standard maps include a paddock plan with identification and accurate areas, bush, dams, drains, lanes, buildings and more. However, a plan can include any feature — only limited by the imagination. A common addition is the mapping of pivot irrigation areas. Why Do Farms Need Good Maps? A map giving accurate pasture measurements has many advantages, including building paddock histories for stock and crop rotation, control of contractor charges, and as a guide to stocking rates. Handy day-to-day uses include describing farm areas to visitors and new employees, use as a daily planner, showing which paddocks are closed for fodder, for the bank manager to assist in financial decisions, to fax contractors with requirements or consultants with proposals for consideration, to indicate water lines, to show switches for electric fences, to identify danger areas such as ditches and slips, approximating the location of Telstra lines and power, for local government dealings and grant applications, to plan irrigation or to send to processors as required. •	To indicate stock water lines, irrigation lines, risers, taps, etc. •	To show switches for electric fences, danger areas such as ditches, slips, etc.